GARLIC BUTTER DEAL NO. 14: SAME AS DEAL 13 EXCEPT GETTING (14) PACKAGES OF THIS WONDERFUL MIX ALONG WITH FREE SHIPPING. 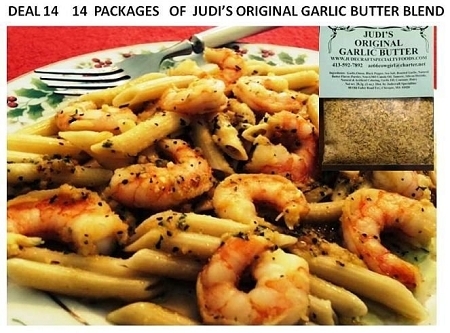 USE JUDI'S ORIGINAL GARLIC BUTTER BLEND FOR SHRIMP SCAMPI, bread dipping, garlic mashed potatoes, and so much more.